By way of Oxford English Dictionary’s Word of the Day, we’re drawn to perhaps summon a demon or two. The first exorcise is in deference to a maleficent entity, who is either facing redundancy owing to the eternal, infernal memory of the internet or is now finding himself racing to beat the devil for a backlog of old business, by the name of Tutivillius, the Worthless One. Tutivillius is charged with maintaining one’s permanent record, as it were, recording one’s misdeeds—specifically the sack of syllables that represent the mumblings, grumblings, gossips and complaints dropped unwitnessed—like so many crumbled cookies of one’s digital footprint—during church service, when one’s thoughts were supposed to be at their most refined and rarified. This recorded testimony is used against an individual on Judgement Day. 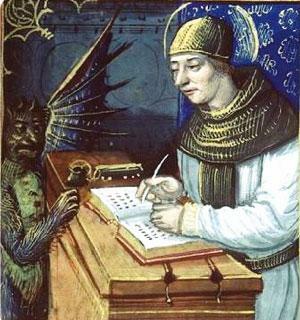 A second—related or conflated demon and the creation of his own handywork—is called Titivillus, whose duty which he gladly discharges on behalf of Lucifer is to introduce errata into copy and text that escapes the keen eyes of scribes and editors and is the bane of proofreaders: namely in infamous publications like the 1631 edition known as the Wicked Bible since some of the Commandments omitted the not part from thou shalt. The two are probably one and the same—owing to a typo which the demon trafficks in. Titvillus is also blamed for mispronunciation and other slips of the tongue. The superstition that the latter possessed orators and haunted the presses is the reason a printer’s apprentice is referred to a printer’s devil, charged with the most onerous of tasks and was the brunt of blame (perhaps nowadays a jamming, problematic laser-printer) when an error popped up.